You are here: Home / Project Management Blog / Methodologies and Concepts / Project Management Methodologies: Which one is better? Somewhere during project planning, you need to make a serious choice. You need to select the most appropriate project management methodology. The problem is that it may be hard to make corrections later. So, you have only one chance. The biggest problem is that all methodologies are commercial to some extent. Even if they are created by non-profit organizations. Therefore, you will always hear only about benefits and advantages of a project management methodology. It could have been a long and profound comparison. But I don’t believe we need to compare methodologies. It like comparing a hammer and a saw. These are just different tools for different tasks. Let’s better define good and problematic areas of each one. But before that, I want you to be precise with terminology. When you search for “Project Management Methodologies” you will get into a mess. The terms framework, approach, methodology, life cycle, and processes are interchanged and confused. Let’s try to clarify this first. A Project Life Cycle is a series of phases that a project passes from beginning to the end. We usually divide a project into phases to meet our control needs. In other words to make a project more manageable. Nature of a project and the industry also influence the life cycle. A Project Management Framework is a set of concepts that are used to achieve a project goal. Each framework is based on a set of principles that give some advantages to a client, a project team, or both. These principles also introduce limitations. All frameworks share common concepts like planning, executing work, delivering results. On the other hand, frameworks designate a particular set of values. For example, an ability to adapt to changes or ability to predict scope, cost and time needed to deliver a result. Project life cycle can dictate specifics of a framework. Does a life cycle or a framework take precedence? It depends on the nature of a project and an organization. Project Management Methodology is merely a set of strict processes, roles, and artefacts. A methodology is aimed at implementing a project within a given framework. There might be several methodologies that work under one framework. Most methodologies introduce a specific life cycle. There is no universal standard here as both a project management methodology and a company can modify it. 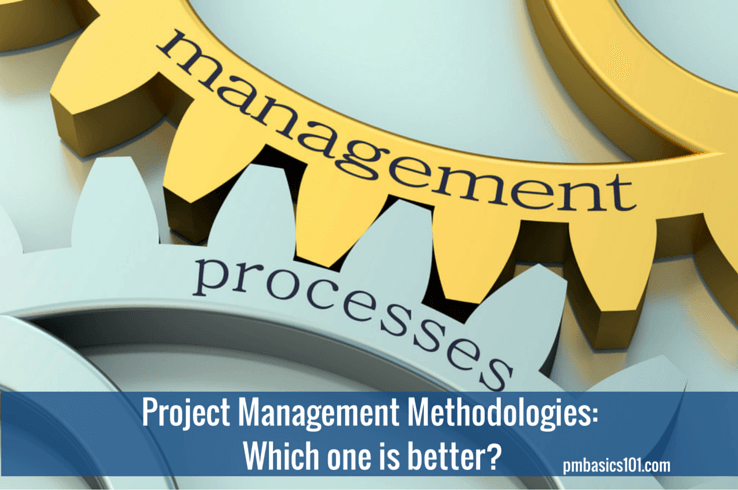 So how to choose a project management methodology? You need to understand how different methodologies work and their prerequisites. You should be clear about strong and weak sides of each one. You need to analyze how your organization works. Does it have a suitable environment, skills and technical aids to implement any specific methodology? Identify what methodologies already in use. Make a short list. You need to analyze the nature of a project, specifics of industry, regulations and constraints. Additionally, you may consider the type of a contract you work with. You need to analyze your ability adequately define requirements for an end result of a project. It also includes the capacity to reach project objectives and stakeholders expectations. They may change during project lifetime. So, you need to define the optimal way to manage changes. Define the most suitable methodology that complies with needs identified in point 1-4. Traditional or Predictive approach focuses on identifying project scope, costs and duration early on. Changes are actively avoided and closely managed. Project team follows the central principle – plan before you act. The predictive approach helps to develop a project in a systematic way. Moving from project inception to planning, then, to execution and closure. This method is preferred when the product to be delivered is clearly understood. Also, when a product only have value when delivered in full. Adaptive, change driven, or Agile approach is based on principles described in Agile Manifesto. This approach is based on ongoing collaboration with stakeholders. It is intended to accept a high level of changes. Agile is preferred when it ‘s hard to define requirements and scope in advance, when environment rapidly changes and when the value can be delivered in small increments. PMBOK® Guide does not describe a project management methodology. I will start with answering a frequent question. No, PMBOK® Guide does not describe a project management methodology. It is a set of good practices and processes. In most cases, they cover way more than any project would need. There is an Annex A1 in PMBOK® Guide. It describes a standard for project management. In general, you can consider as a plan-driven methodology. Nevertheless, you can use all processes and tools of PMBOK® Guide in other methodologies like PRINCE 2. Or you can combine some of the practices into your own methodology. Perfect for critical and high-value projects. Plan-driven approaches require you to perform comprehensive planning upfront. It includes collection of requirements, defining scope, developing budgets, and identification of risks. At each stage of a project, you will have a better understanding of your chances for success. Good practices cover all aspects of a project. Depending on nature, complexity, and size you can choose an appropriate set of processes, tools, and techniques. PMBOK® Guide has all necessary information. Traditional methodologies are scalable. With the same set of the processes, you can manage small, medium, large projects, programs and portfolios of projects. The concepts and principle are the same. Changes are costly. In general, changes are actively avoided. It does not mean that you can’t make changes. You just need a comprehensive process to manage them to stay within constraints.Nevertheless, you can easily apply rolling wave planning approach. Just manage unclear, ambiguous part of a project on a higher level. Proficiency is required. You don’t need much knowledge and experience to fall an established methodology. However, plan-driven methodologies usually require monitoring and controlling activities. Which in turn may require changes in the methodology. Without proficiency in plan-driven approaches, it will be difficult to make educated decisions.Thankfully, you can find a lot of training in both PMI and PRINCE 2 approaches. And they provide them on different levels. There is so much talk and resources on Scrum that I don’t want to duplicate the general information here. I would suggest you to visit the original sources for the basic introduction. You can find more details in their Scrum Guide. There are serious debates whether you must follow Scrum and Agile prescriptions to the letter to get promised benefits. I believe that you need to modify methodology to adapt to the project nature. However, you must have a bag of knowledge and experience for that. So, I suggest to follow prescriptions to the letter. At least for a few sprints. Check this free book called Scrum and XP from Trenches. It has all the information you need today. Adaptivity. It is much easier to introduce changes to the product. Well, it is the nature of this project management methodology. And it goes for both product requirements and project processes. Though changes can happen between iterations. Changes to the current sprint are not accepted. Iterations are time-boxed. You need to plan in details for 2-4 weeks of work. It is much, much easier than a planning a year long project. Relative complexity estimation. In Scrum, development team estimates the complexity of a task. Short feedback loop. Product Owner provides feedback on the progress and current state of a product every iteration. Change Requests are obsolete in general. Therefore, you will have less amount of conflicts with a customer. His expectations can be closely managed. Hard to define real Product Owner. Scrum works best when a team can access real product owner. It is a person or a group of persons who will be using the results of your project. Scrum (Development) Team. Characteristics of the development team are very demanding. Team members should be self-organizing. Which means they should be well motivated as well as proficient, cross-functional and mature. They all should be comfortable and willing to work on all aspects of product development. It is hard to safeguard Scrum Values Scrum requires coaching of Scrum values. In fact, it means that a Scrum Master should be good at sales. He must be able to explain why Scrum is the right approach. Moreover, he should ensure that customer understands why he should follow Scrum prescriptions all the way. Organizational environment should be Agile. That is something Scrum framework does not cover. Nevertheless, the performing organization should be ready for Scrum. Both technically and mentally. A Scrum project in the non-scrum environment is usually a disaster. Quality assurance may be difficult. By the end of each iteration, you need to provide potentially shippable (to the market) product. Clients and customers like this trait. However, implementing it is difficult. It requires technical aids, robust processes and skilled team. It all takes time. That is not something clients like to hear. Kanban is also an Agile methodology. It implements Lean approach. In essence, Kanban tries to match the work in progress with the team’s capacity. There is much common between Scrum and Kanban. Nevertheless, these are different project management methodologies. Read this short and highly illustrated book Kanban and Scrum – Making the Most of Both. Very straightforward and customizable methodology. It has only three prescribed items. The level of adoption is the lowest among other approaches. Very Adaptive. In Kanban, changes can happen anytime. Priorities can change in backlog many times per day. Nevertheless, the team will try to get the top priority task through the process as fast as possible. Kanban visualizes bottlenecks. With Kanban bottleneck in the workflow become apparent. The development team is focused on removing them by design. Therefore, you have an ability to improve your processes and workflow constantly. Kanban allows continuous delivery. You can continuously add features and value to the product. It is up to the team’s discretion when to include an increment of work. Kanban is too simple. The methodology speaks little about how to get a project from start to finish. It is all up to you. You will need to identify the workflow, definition of done, technologies that will support your workflow, etc. Everything. Kanban works best when mastered. Behind the simplicity, there is a sturdy workhorse. Though to get all benefits you need a lot of experience, trials and errors, and good guts feeling. Nevertheless, it is an agile methodology I would suggest you to start from. Team should be proficient. As with Scrum, Kanban requires a certain level of skills, motivation, maturity and personal responsibility. Working with the unmotivated or unskilled team might be difficult. None of them are better or worse. Project management methodologies have particular implication where they perform best. It depends on circumstances, nature of a project and environment of a performing organization. A good question to ask an a hard one to answer. I think it all depend on many factors and we should be happy to have the choice depending on pur needs. By the way, I gave Zenkit a try not long ago. Keep up the good work!